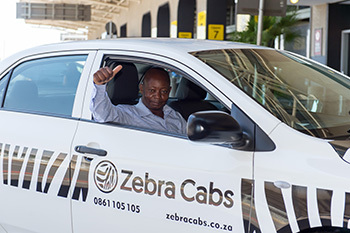 What ever the weather, hail a ZebraWhether you are out celebrating the year end or making your way to the airport, we'll make sure you'll get there safely, and on time.Book online. Call us. Download the app or just wave when you see us. Proudly local. Homegrown service. Reliable, so you don't miss out.Whether you are out celebrating the year end or making your way to the airport, we'll make sure you'll get there safely, and on time.Book online. Call us. Download the app or just wave when you see us. Proudly local. Homegrown service. places to go. people to see. events to attend.places to go. Zebra Cabs is a proudly local home grown Cab Service based in Gauteng. Our vehicles are 100% roadworthy and custom fitted with leather seats, plus air-conditioning for your comfort. Zebra operators are also professionally-trained. They are more than just drivers, they are small business owners. 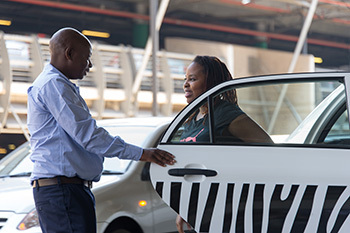 With Zebra Cabs, you can book online, via the app or call our call centre. We also have flexible payment options. Pay cash, with credit card or even swipe your debit card in the cab – it’s your choice. 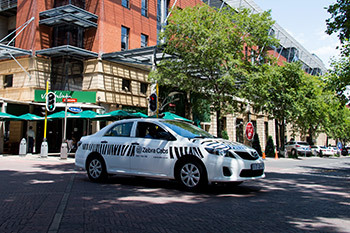 Zebra has a fleet of over 180 cabs, and growing. All our vehicles are custom fitted and smartly branded – so you can spot a Zebra instantly. You can catch the nearest Zebra or pre-book your trip with your smartphone or tablet. Getting from Point A to Z just got more convenient. Join the Zebra herd and take advantage of our professional training, support, technology and vehicle financing. We are here to help you make your small business a success. Let Zebra Cabs take you places. What started off as a "cool idea", turned into a fleet of cabs roaming the streets of Gauteng - soon to migrate to to your area.